Green 59 is a new mobile home with French doors to a large front veranda with spectacular sea and lagoon views.Green 59 has a well equipped kitchen and dinning area, lounge, large double, big twin room and large bathroom with shower. It is double glazed and there is central heating. On Chesil Vista Holiday Park there is access to indoor swimming pool,sauna,gum,shop restaurant, bar and high quality nightly entertainment. There is a beautiful sandy beach 200m away. Also Portland harbour which is great for yatching, kayaking boarding and many water sports is also 200 m away. The mobile home overlooks the Jurrasic Ccast and Chesil Beach. Historic and picturesque Weymouth harbour and beach are within a 10 minute car ride. I am a primary school teacher and my wife Melanie is a university Finance officer. Megan is 7 and just finishing Infant school. We live in a village called Wheathampstead near to St Albans in Hertfordshire. 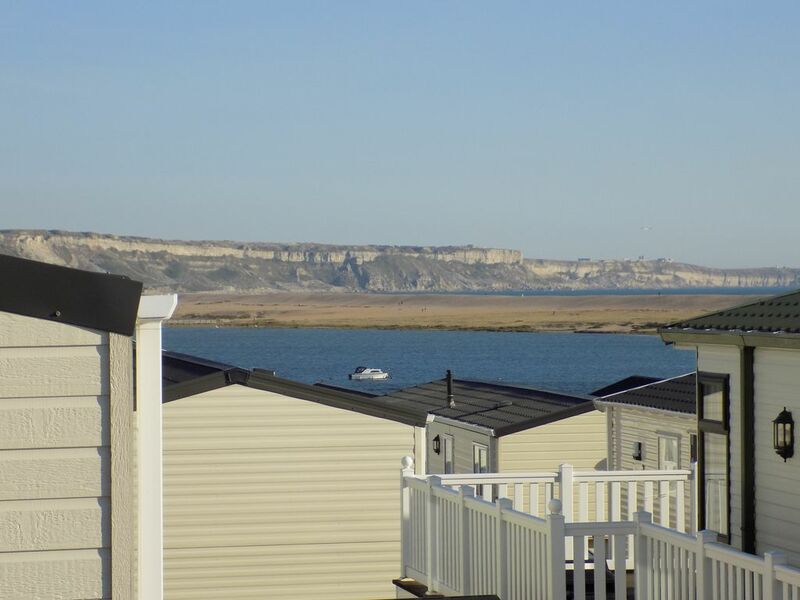 This is a beautifully decorated, cosy and comfortable caravan with amazing views of the sea, Portland harbour and Chesil beach and the Fleet lagoon. The site is a small locally owned site with wonderful leisure facilities including indoor pool,sauna and gym. There is a well run children's club and fantastic nightly entertainment. Fantastic harbour,sea and lagoon views. it is really a home from home decorated to a high standard. it has a large side and front veranda were the sea views can be enjoyed on outdoor furniture. A good size bathroom with fitted shower. Yes included in the cost. Yes for two cars with ample parking on the site. A comfortable area for 4/6 to relax in. Double shelved oven with grill. A large side and front veranda with beautiful sea views. A good sized indoor pool. We were very pleased with our stay. The accommodation is very new and clean with beautiful views of Chesil beach. It was the perfect base for our family holiday and we can't recommend this accommodation enough. Really lovely location and great accommodation. Beautiful area with lots of places to go and see. Would highly recommend. Loved staying here, the caravan is perfect and really clean and modern. The veranda is a great addition and so safe for the children especially because you can lock the gate so no worries about the steps and little ones! The site is nice, very friendly staff and Weymouth has so much to do. Friendly and welcoming site. Mobile home very clean and comfortable we packed our long weekend with a trip into Weymouth a visit to Portland and a walk along Chesil beach great time had by all.